After months of working on-campus to rename the Consortium for C!#@n Coal Utilization, here at Washington University, we decided to take our concerns to the source: the corporate headquarters of Peabody Energy in downtown St. Louis. Since our flashmob against our administration’s coal-sponsored “America’s Energy Future” Conference, a unanimous Student Union Senate Resolution calling for the renaming of the Consortium and a meeting with the head honchos of the Consortium have not yet yielded our goal – to remove the misleading term "c!#@n coal" from the Consortium's name – we decided to take our concerns downtown. This past Friday, March 26, 2010, over fifty Washington University students and St. Louis community members gathered outside of Peabody Energy to protest the company's business practices. WashU senior Todd Zimmer laid out our demands for the crowd and for Peabody executives. “We want an end to dirty energy," he said, "we want an end to lies about c!#@n coal, ... And we want an end to the relationship between Washington University and Peabody Energy." Many St. Louis employees emerged from their office buildings to hear our chants of “C!#@n coal, hell no, that’s a lie, it’s got to go,” and “coal, coal, no solution, we are sick of your pollution,” accompanied by a drum set, full-size banners, and signs held by protesters. While there were many police officers – both city and Peabody security – the protest remained wholly non-violent. We had expected the Peabody security contingent; earlier this week, after the protest was advertised on Facebook and in pamphlets, an anonymous Peabody employee leaked us an internal memo. This memo alerted employees about the protest, telling them to avoid the front entrance, and described us as “anti-everything” activists. 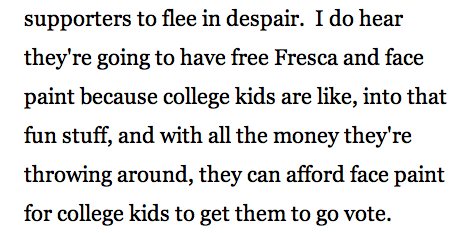 WashU senior Jennifer Marienau dispelled this notion. “We are not anti-everything,” she told the group in a speech, “We’re not anti-community. We’re not anti-solution. We’re for people power, not destructive power.” We students ended our peaceful demonstration with a die-in. With each iteration of the chant, “No joke, coal kills!” members of the protest went fell to the ground in a symbolic representation of the millions endangered by Peabody’s dirty practices and significant contributions to climate change. Our protest was part of the People’s Settlement, a week of action highlighting the unethical behavior of corporations in St. Louis that continually to place profits over people. Peabody certainly qualifies as one of these unscrupulous corporations. This is a company whose subsidiaries engage in the destructive and dangerous practice of mountaintop removal. This is a company that has heavily funded efforts to block all climate legislation up to this point, and is now suing the EPA over its right to regulate greenhouse gases under the Clean Air Act. This is a company that has adamantly denied the reality of climate change, while developing their dishonest c!#@n coal marketing campaign. This is a company that recently blackmailed St. Louis, threatening to abandon the city and move its jobs elsewhere, unless it received $10 million for "office improvements." And for those of us at Washington University in St. Louis, this is a company that has recently been given a great deal of undue power at our university. In December of 2008, WashU announced the formation of the Consortium for C!#@n Coal Utilization, funded with $5 million each from Peabody Energy and Arch Coal and $2 million from Ameren UE. Students, faculty, and members of the St. Louis community immediately opposed the Consortium because its name featured the term "clean coal," a disingenuous advertising slogan and a conspicuous feature in light of the Consortium's corporate sponsors. In August 2009, Peabody CEO Gregory Boyce and Arch Coal's CEO Steven Leer received spots on WashU's Board of Trustees. Peabody's Vice-President of Government Relations Fred Palmer serves on the Advisory Board to the Consortium. At WashU, we will continue to push until the dirty money of Peabody Energy, as well as Arch Coal, is removed from our campus, and the name of the Consortium for C!#@n Coal Utilization is changed. As students warned this Friday, "Chancellor Wrighton, we be fightin', 'til the coal is gone!" Durbin and Burns Prepare to Begrudgingly Speak with "Hippies' and "Socialist Clowns"
Students at Meramec Community College generously extended an invitation to the leaders of the tea party opposition to Proposition A, the ballot initiative that would restore and expand public transportation in the St. Louis region with a 1/2 of 1% sales tax in St. Louis County, for tomorrows Transit Fair. As you can see, tea partier Jim Durbin, who will be attending the event, does not have a lot of respect for today's young people. Says Durbin: And later: Now Durbin's smart enough to not act like that in public, but it's pretty amazing that he's willing to disparage the students who invited him to speak at their campus without even knowing anything about them. And as for what John Burns, leader of the anti-transit group, thinks, you can see in his letter to Gateway Pundit that he believes the people who support Proposition A are, "SOCIALIST CLOWNS" who are trying to "DEFEAT LIBERTY" (caps lock problems from Burns's original). That group of "socialist clowns" includes Republican Mayor John Nations, Senior Vice President of Programming for the right-wing 97.1 station John Beck, and the Regional Chamber and Growth Association. And speaking of Prop A and the misguided tea party opposition, Chesterfield Mayor John Nations has a fantastic op-ed in the St. Louis Beacon that corrects the misinformation Burns has been spreading. Breaking: Charges Against Brian Matthews Dropped! Just heard from Brian that the prosecutor is dropping the charges against him! Great news for a great guy! I previously wrote about Matthews here, noting that the police report did not seem to fit with the video. The next hearing for Elston McCowan is April 20. 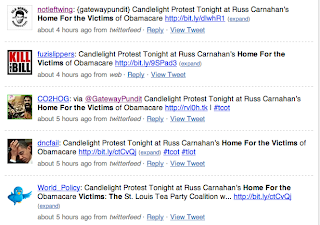 Gateway Pundit Keeps On Misinforming! Jim Gateway Pundit Hoft says blatantly false things so often that it's not even worth it to try to catch them all. But he's had three especially amazing whoppers in the last week that show perfectly the type of work that characterizes his propaganda blog. First, he "reported" that Eric Cantor's office had been shot at, a claim that was contradicted by the police, who said the bullet had been randomly fired in the air. Hoft never corrected his story. 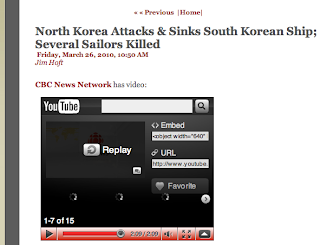 Then, Hoft had a screaming headline: North Korea Attacks & Sinks South Korean Ship! 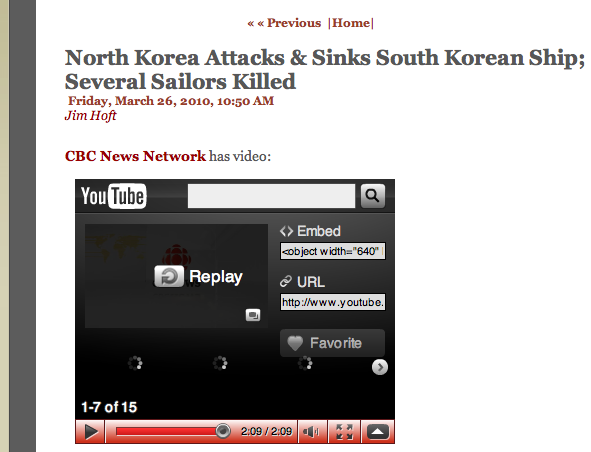 Actually, North Korea had nothing to do with the ship sinking. Hoft actually did correct this one, but it's amazing that he's was willing to scream that North Korea attacked when even the news sources he cited were not making that claim. 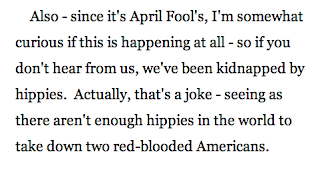 Only problem: Hoft's source, EcoEnquirer, is a satire site. Whoops! A new controversy erupted locally as St. Louis Tea Party members accused the local media, SEIU, and Democratic politicians of "making a mountain out of a molehill" after members of the public criticized the Tea Party's decision to simulate beatings, torture, murder, and unspeakable sexual acts on a bloody corpse mannequin with the words "Democrat politician" written on it. The Tea Party leadership brought the mannequin to a rally protesting the idea that taxes would increase for the wealthiest 1% of wage earners in order to ensure that all Americans had access to health care. "This whole thing is an outrage, and is directly attributable to Charlie Dooley, Russ Carnahan, President Obama, and MoveOn.org," said conservative blogger Jim Hoft, who brought the bloody corpse mannequin. "We used the mannequin for fun carnival games, like Burn the Communist Alive and Drive a Stake Through the Evil Vampire's Shriveled Heart. 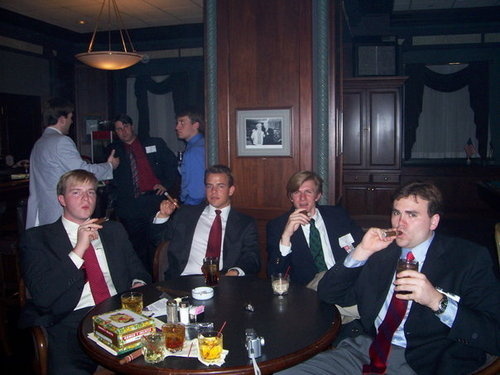 Heck, we even had our children playing the game." Some critics suggested that the actions might be going a little far. "It seems to me like when you practice gouging the eyes out of a stuffed corpse while chanting 'let's all murder the bloody tyrants who are planning to steal our money,' you might be encouraging other people to commit actual violence," one astonished onlooker said. But the Tea Party was quick to dismiss such charges. "This is nothing more than the liberal establishment trying to silence all dissent," said Tea Party co-founder Bill Hennessy. 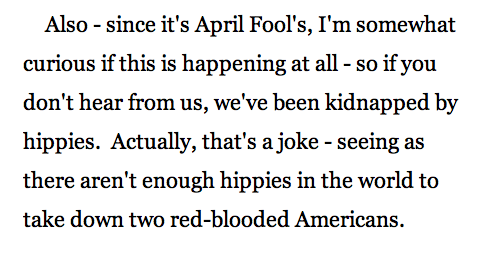 "The idea that Stab the Hippie is a violent game is completely disproved by the fact that we said a prayer at the beginning of the rally for all of the unborn fetuses that Obama has murdered in cold blood." 97.1 radio host Dana Loesch devoted her entire show to the topic, saying that the incident was direct proof that Democrats hate free speech. She pointed out that some Democrats had claimed that the Tea Party hung the bloody corpse mannequin from a street light poll. However, after analyzing video and photographs from twelve different angles, Loesch said that it was clear that the corpse was actually hung from a traffic light, which proves that all liberals are liars. Loesch also claimed that the incident proved that liberals were racist and sexist, but she didn't bother to explain why. Make sure to tune in tonight for a special Fox 2 News segment titled: "Murdering Politicians: Irresponsible Stunt or Good-Natured Fun?" to hear more about this incident. NOLA dropped felony charges against James O'Keefe and others. http://bit.ly/cKIvOO So much for a trumped-up witch hunt! I have met James and Joe and find them to be patriotic men of character. isn’t that good enough for a courageous, patriotic young prankster that was trying to expose corruption? The Tea Party is very excited because O'Keefe and his friends are expected to plea bargain to a lesser charge and avoid felony charges. But if O'Keefe was innocent, why would he be pleading guilty? As is now well documented, the whole gulag "controversy" was a hoax. The group only filled out paperwork to pass our literature, and then violated the university's guidelines for building a structure on campus. James O'Keefe and Joseph Basel flew in to St. Louis specifically to videotape the administration and try to make it look like they had an agenda against conservative students. In other words, O'Keefe, Basel and Burns were intentionally disregarding the rules in an attempt to set up the administration. You don't need to take my word for it. You can read the account of Young Americans for Liberty member Cailtlin Hartsell to know that Burns claim that he was being "persecuted" was knowingly false. Given this background, the rantings of John Burns in this blog post have to regarded as either completely delusional or willfully deceptive. As commenter Michael M, former president of a conservative group on the Wash U campus, noted in this SMD post, he was involved in far more controversial displays that were "never hampered" by the university because they, in contrast to Burns, followed the actual rules. 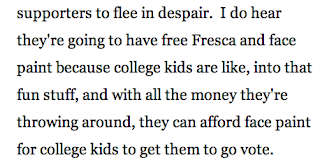 The idea that Washington University is "oppressing" conservatives is absurd. THERE IS NO FREE SPEECH ON COLLEGE CAMPUSES. If there is no free speech on colleges, then what does that mean for liberty activists like you? 1) You must "steel" yourselves for inevitable confrontation with cops. As with everything else socialist, policies -- even arbitrary ones -- cannot be enforced peacefully. At some point, they will have to bring men with guns and night sticks and handcuffs who are authorized to do violence against you. You must prepare yourselves for this encounter. Whenever you demonstrate for liberty and the cops come for you -- and they will come for you sooner or later -- as long as you have video cameras ready, and press realeases ready, chain yourself to anything you can and yell, "HELL NO, WE WON'T GO. WE HAVE THE RIGHT TO FREE SPEECH AND NOT YOU OR ANYBODY ELSE ON THIS EARTH IS GOING TO SHUT ME UP OR SHUT ME DOWN. I HAVE A RIGHT TO FREE SPEECH. I AM AN AMERICAN CITIZEN. THIS IS A PUBLIC UNIVERSITY." So, you should realize that there is considerable risk. BUT SO WHAT? YOU ARE A FREEDOM FIGHTER! OF COURSE THERE IS RISK! The answer then, is not to tuck your tail between your legs, but rather FIGHT. FIGHT. FIGHT. Your parents will try and calm you down and scare you into inaction. DON'T LET THIS HAPPEN. Do you believe in free speech? If so, there is no choice. You must act and damn the consequences. What future do ANY of us have if we lose our liberties? So what does all of this mean? It means your administrator-overlords have sold-out. They're part of the 'captor class' now. Whatever decency they had as people prior to holding their present job is now gone. They will trample upon your rights wittingly or unwittingly. And it doesn't make a damn bit of difference to them even if they realize it, because their agenda is the same as the school's: enforce the agreed upon agenda of the prevailing winds of power -- which at this point happens to be anti-liberty. So I guess the bottom line is that you shouldn't expect justice from your captors -- they've already given themselves over to the dark side. The key is not becoming hostages yourselves. Leiser ignored the entirety of the content from both of the articles, and instead settles for getting a quote from John Burns: "There's a myth that there's free speech on campus." Like I said, basically bending over backwards to make an absurd position sound as reasonable as possible. I'm not sure how the mainstream media expects people to actually stay informed when they operate in this way. I don't think they're intentionally trying to promote a right-wing agenda, but the warped notion of "balance" taught in journalism schools basically leaves people completely uninformed. Monday, March 29, the People's Settlement concludes with a March of the Jobless (and those in Solidarity) starting at Kiener Plaza (8th and Market) at 10 AM. Also Monday, local (and international) activist Anna Balzer will be giving a workshop in Eliot 103 of the Wash U campus on how to speak about the Israel/Palestine conflict at 5:30 PM. Also Monday, the Young Democrat of St. Louis are having their monthly membership meeting at 6:45 at Maggie O'Brien's. Also Monday, the Association of Black Students at Wash U is hosting rapper Common at the Graham Chapel at 7 PM as part of the MLK Symposium Series. Also Monday, Pride St. Louis is premiering their promotional video from 7 to 9 PM at the Foxhole at the Atomic Cowboy (4140 Manchester). Also Monday, author Jabari Asim will be speaking about his book "A Taste of Honey" at 7 PM at Left Bank Books (321 N. 10 St.). Also Monday, the Wash U Co-op (6021 Pershing) is hosting a screening of Capitalism: A Love Story at 8:30 PM. Monday through Wednesday, check out QFEST, a LGBTQ movie festival, at the Tivoli! All week long, the Alliance for Students Against Poverty (ASAP) at Wash U are having a rummage sale in the Gargoyle raising money for a Haiti Relief Fund. 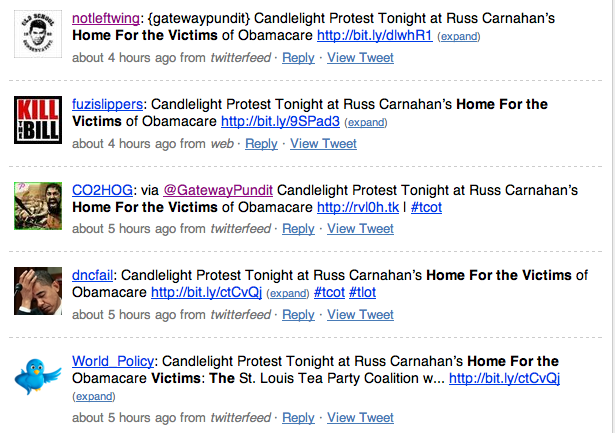 Tuesday, March 30, Organizing for America is celebrating the health care reform victory at locations around St. Louis! Wednesday, March 31, Wash U's Green Action is teaming up with the Performing Arts Department for Dancing for Prop A from 12:55 to 1:05 in the DUC Courtyard. Also Wednesday, Food not Bombs will be cooking a serving vegetarian meals in St. Louis from 4:30 to 6:30 PM. Also Wednesday, there will be a Get St. Louis Moving fundraiser for Prop A from 5:30 to 7 at the Mai Lee restaurant. Also Wednesday, former Senator Jim Talent will be discussing how much more difficult it is to spout right-wing talking points after being soundly defeated at the polls, or something along those lines, at the Emerson Conference Room at Webster University at 7 PM. Wednesday through Saturday, there will be 2 PM matinees of the movie Skin at the Missouri History Museum. Thursday, April 1, check out the Black Arts Expo at Webster University's University Center (175 Edgar Road) from 4 to 8 PM. Also Thursday, NARAL is having an April Fools Day fundraiser from 5 to 8 PM at the West End Grill (354 N. Boyle). Also Thursday, the Muslim Student Association and Jewish Student Association at Wash U are teaming up to host the Laugh in Peace Comedy Tour in Wilson Hall, Room 214, at 7 PM. Also Thursday, this month's City Affair will focus on the new City to River group, working to increase connections between the downtown and the riverfront. City Affair will be at the Morgan Street Brewery (721 N. 2nd St.) in Laclede's Landing at 7:30. Friday, April 2nd would be a good day to check out the Dogs Can't Vote...You Can exhibit at Framations (218 N. Main St., St Charles) in conjunction with the ballot initiative to end puppy mill cruelty. Saturday, April 3, the Urban Literati Fundraiser from 7 to 8:30 PM at the JC Penny Auditorium on the UMSL campus will raise money for local teen writing programs. Also Saturday, Nancy's Place (4510 Manchester) will be hosting a Lady Gaga themed fundraiser for PROMO from 9 PM to 1 AM. Sunday, April 3, and every Sunday, there will be a vigil for peace at the corner of Lindell and Grand at 7 PM. 1. Burns falsely claimed that Washington University shut down his gulag display because it was offensive, when in fact they shut it down because Burns' group did not mention that they were building a structure, and instead said only that they would be passing out literature when they filled out the paperwork. 2. 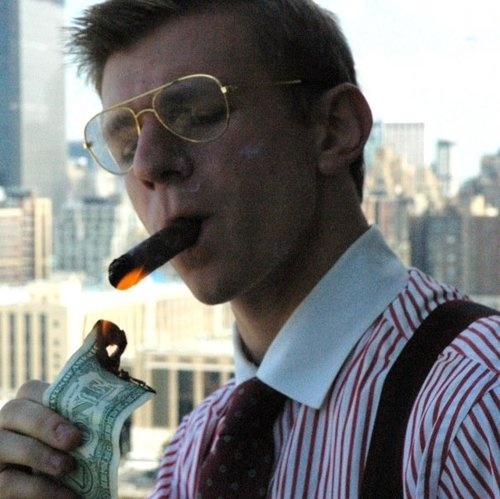 James O'Keefe and Joseph Basel, two of the people arrested in New Orleans, flew to St. Louis specifically to secretly videotape Washington University employees and edit the tapes in an attempt to claim that the university was "biased" against conservatives. 3. Burns accused Washington University of "fraud" after the university requested that his group pay for the university's cleanup of their vandalism (Burns, by the way, is not a student, and the student members of Young Americans For Liberty have distanced themselves from him). 4. Burns went out of his way to sabotage an LGBT rally, writing "free abortions" on a sign at the rally.. There's actually quite a bit more, so please read the full profile here if you haven't already. About a week ago I wrote a post claiming that the TV local media is enabling extremist antics from the local Tea Party by allowing them to act as crazy as they want at their rallies and on their blogs while going out of their way to present them as reasonable in news reports. One might think after a week of "coffingate" that this is starting to change, but I have to say that the coverage has been almost universally disappointing. First of all, the St. Louis media (with the exceptions of Chad Garrison and Jake Wagman) did not really report on coffingate until an article appeared on Politico. At that point, all three TV stations picked up the story. But it's not like the information about what happened was hidden, and I think it speaks poorly of St. Louis when the local media doesn't recognize an interesting story themselves and instead only covers it after it was reported by a national outlet. Furthermore, the TV news reporting all left out relevant context to the story, such as the fact that photos of Russ Carnahan were burned the day before while the tea party chanted "death to the dictator." Worst of all, in my mind, is the fact that after at least four days of reports on this issue by TV, newspaper, and radio outlets, the Tea Party has still not been asked to explain why they went to Congressman Carnahan's home. As I mentioned in a previous post, they had already said a prayer outside Carnahan's office, so what was the further message being sent from going to his house other than, "we know where you live?" Just another example of how there's zero accountability for the St. Louis Tea Party when the media allows them to say and do anything without bothering to ask questions. It was obvious that KMOX radio host Mark Reardon, a self-professed fan of Rush Limbaugh and of Gateway Pundit himself, was not going to ask Gateway Pundit (Jim Hoft) any tough questions as he interviewed Hoft purportedly to "get the facts" about the recent "coffingate" controversy. Reardon was happy to play along with the tea party story that the whole thing was the result of a massive conspiracy between the Left and the mainstream media. And he naturally failed to provide any relevant context for the incident, such as the fact that, according to Gateway Pundit's own blog, the tea party had just the day before set pictures of Congressman Carnahan on fire while chanting "death to the dictator!" Do you think that...there are some people who are going to say you guys, OK, maybe you get away with it going to the office, but you crossed the line when you went to his home. Do you feel like that's a possibility at all? Oh certainly, I understand that there are people who feel that way. Um....we were...um...I was one who, maybe that wouldn't have been my idea, but I did go along with the consensus of the people I was with...and we made sure we weren't on his lawn...we weren't on the grass...we didn't leave anything there...we were there for 10-15 minutes and left. And there was no one home. And we didn't got up to his door. Second, though Hoft deleted his original tweet, you can see from people's retweets that he initially announced that the rally was going to be at Carnahan's home. Hoft's attempt to pretend that this was just a last minute decision and that he was just "going along with the consensus" is a complete farce. He, and the rest of the St. Louis Tea Party, are just lucky that interviewers like Reardon aren't willing to ask them any tough questions. The St. Louis Tea Party, after a weekend of chest-thumping and saber rattling, is now trying to portray themselves as victims of a Lefty and Media conspiracy to make them look like extremists. I think there is overwhelming evidence that their actions over the past week were specifically intended to intimidate members of congress and/or rile up their followers, potentially into violence. I present it here. But if Congress cut the ties to the contract WE wrote, aren’t we, the people, free from any obligations to the federal government? It would seem that we are citizens of our states and we owe no allegiance, legal or moral, to the government in Washington...Now, what do we do about it? If Congress continues on its present course – to inflict socialized medicine on America by decree – the reaction from the people will be something that we have never seen before. But if this bill passes, all bets are off. Every aspect of the government in Washington is fair game. It would seem that the American Experiment is over. It’s time to choose between freedom and tyranny, and no one will be spared the decision. Then, on Saturday, the Tea Party had a rally outside of Congressman Russ Carnahan's office. At the rally, the tea party (1) used shoes to whack a picture of Russ Carnahan, (2) kicked the photo of Carnahan, (3) set up a game where people would throw boots at a picture of Carnahan, (4) even encouraged small children to throw the boot at Carnahan, and (5) finally ended by setting the picture of Carnahan on fire while Dana Loesch said things like, "This is how a fire smells when it's burning Tyranny". After the rally, Bill Hennessy unleashed a series of tweets calling for "revolt:"
So then we get to Sunday evening, where the tea party decided to bring a coffin to Russ Carnahan's office, and then to his home. If they had just kept the coffin at the office, then fine, it would have been a somewhat silly service marking the deaths of people who they mistakenly believed would die because of the new healthcare bill. But they decided to go to Russ Carnahan's home. There is absolutely no reason why they had to have a "prayer service" at Representative Carnahan's home rather than his office. As Karen remarked on Twitter, it was intended to send a clear message of "we know where you live." That, combined with all of the other extremist rhetoric of the past week, shows that all of the claims of victimization by the St. Louis Tea Party are completely bunk. They were definitely trying to intimidate, and they should be called out for it. Hundreds rally while Carnahan is booted and torched? Now why would anyone think the St. Louis Tea Party is led by extremists? I think this, combined with the fact that the St. Louis Tea Party brought a coffin to Representative Carnahan's home the next day shows that this group is getting out of hand. If Ed Martin would like to be regarded as a serious candidate, he should start by condemning this kind of behavior. RNC Chairman Michael Steele, National Tea Party organizer Amy Kremer, and even Bill O'Reilley accept the accounts of multiple members of the Congressional Black Caucus, Representative Barney Frank, Representative Ciro Rodriguez, CNN reporter Dana Bash, and a Politico reporter who all reported that racial and homophobic slurs were yelled by tea party crowds in Washington D.C.. But here in St. Louis, our local extremists have been leading the nationwide charge to claim that the whole thing was a giant leftist conspiracy designed to take over the country. Bill Hennessy has called civil rights hero John Lewis a "liar" and a "racist." Dana Loesch went on the O'Reilley Factor to peddle her conspiracy theories, and then lied about calling the Congressmen a liar. Jim Durbin said that Representative Cleaver, who was spit on by the crowd, is a, "A no-good, race-baiting hustler who holds his job because his daddy was an effective politician." And Gateway Pundit, who has been caught linking to race-baiting videos from White Supremacist websites in the past, is leading the charge with several stories calling everyone involved liars. There are at least two points in the video where the word n****r is arguably shouted. The man yelling at the 0:44 second mark sounds the most clear to me, and the woman shouting "booooo" sounds like she says it at the 0:16 mark. Do I know with absolute certainty that they said the n-word? No, its hard to tell. But it's also equally clear that you can't tell with certainty that they didn't say those words. And certainty is what the Tea Party is claiming, and what they would need to claim in order to support their allegations that seven members of congress and at least two reporters are all "lying." Their continued willingness to throw out inflammatory insults without support is truly pathetic. You know you've gone pretty far off the deep end when a conversation with Bill O'Reilley ends up with him looking like "the sane one." O'Reilley for some reason had Dana Loesch on his show to discuss the recent events where members of the Tea Party crowd in Washington D.C. yelled racial and homophobic slurs at members of Congress. Loesch went off on her ridiculous argument that because she saw a 20 second clip where it wasn't obvious whether slurs had been yelled, she had OMG PROOF that no slurs were yelled. Of course, several different politicians as well as a CNN reporter and a Politico reporter said they heard slurs, and Michael Steele as well as a national tea party leader denounced the slurs. O'Reilley tries to throw her a lifeline by saying that it's unfair to characterize the actions of the whole crowd by the actions of the few, but Loesch wasn't having it and dove straight back into her conspiracy theory that all of the congressmen were making the story up. Loesch then goes on to misrepresent the Kenneth Gladney incident by saying (2:55), "I find it incredibly disingenuous for people on the left to completely ignore and suppress that incident when it's on tape frame by frame you can see it happen." Actually, after originally claiming that the assault was captured on tape, the local tea party had to change their story to claim that the assault was not actually on tape because the video only shows Perry Molens pulling Gladney backwards while their official story is that Gladney was "brutally beaten" by several people including Elston McCowan (who was on the ground at the beginning of the video). Yup, Dana Loesch, busted lying. Again. One last thought: probably the reason that Loesch can't go along with O'Reilly's claim that it's just a few whackos is because in St. Louis it's not just a few random people but rather the tea party leaders themselves who do extremist actions like burning photos of Congressmen and carrying coffins to their houses. I don't know how desperate a radio station or morning show would have to be to hire a member of the fringe St. Louis Tea Party as a "political analyst," but I do know that the decision is guaranteed to produce embarrassing results. The latest example of the St. Louis media's institutionalized rightward tilt (with exceptions and caveats) is the fact that the McGraw Milhaven show has right-wing extremist and tea party organizer Gina Loudon on once a week to provide "political analysis." So let's check out the embarrassing, disingenuous political theater that constitutes Gina Loudon's political experience. Yesterday, one day after setting images of Russ Carnahan on fire while saying, "this is the smell of tyranny burning" (cheered on by Ed Martin), the St. Louis Tea Party brought a coffin to Carnahan's office. Was the coffin for people who died or are suffering, like say the thousands of soldiers who died in Iraq? No, it wasn't. In fact, the coffin wasn't for any real people. It was for people that the Tea Party imagines will die under "Obamacare" because they don't understand the bill. But this was too ridiculous even for them, so they later changed the message to say that the coffin represented the death of freedom. (Gina Loudon is right behind Bill Hennessy). How could a radio station possibly think it's OK to have a "political analyst" who's willing to literally stalk members of congress? What form of analysis will Loudon provide this week? A detailed report on the contents she found in Representative Carnahan's dumpster? An analysis of what his discarded shoes smell like? Listing the times of day that he leaves his curtains open? Loudon's behavior is absurd and dangerous, and KTRS's willingness to give her a microphone to promote Glenn Beck style misinformation makes them complicit in this. All Week is Atlas week at Saint Louis University, with an amazing amount of stuff every day. Get the full calendar here. Tuesday, March 23, stories from the US-Mexico border will be shared from noon to 1 PM at Tegeler Hall, Room 207 at SLU as part of Atlas week. Also Tuesday, Amnesty International St. Louis City will be having their monthly letter writing meeting at 7 PM at the Hartford Coffee Company (3974 Hartford St). Also Tuesday, the Center for Theology and Social Analysis (1077 Newstead) will host Tyler Boudreau for a discussion of his book the Unmaking of a Marine from 7 to 8 PM. Also Tuesday, James McGrath Morris will be discussing his book on Joseph Pulitzer at Left Bank Books (399 N. Euclid) at 7 PM. Also Tuesday, representatives from Robin Carnahan's campaign will be speaking to the Webster College Democrats at the UC Conference Room from 7:30 to 9 PM. Also Tuesday, there will be a discussion of eating disorders from 9:30 to 10:30 in the Library Conference Room of Webster University. Wednesday, March 24, Naomi Klein, author of the Shock Doctrine, will be speaking on American Capitalism at the Graham Chapel of the Washington University campus at 11 AM. Don't miss it! Wednesday through Next Monday, the People's Settlement will be occupying downtown St. Louis, raising awareness of corporate influence on politics. The week kicks off with a 3 PM rally at Citygarden (8th and Market) followed by a protest of the ruthless foreclosures overseen by Bank of America. Also Wednesday, the Phyllis Wheatley Heritage Center (2711 Locust) will host a discussion about Cultural Considerations during the Interview Process from 11:30 AM to 1 PM. Also Wednesday, there will be a People's History of Southern Illinois University Carbondale from 7 to 9 PM at Lawson Hall Room 171. Also Wednesday, the Pulitzer Foundation for the Arts will be hosting a panel on Art and Sustainability from 7 to 9 PM. Also Wednesday, the documentary Iron Ladies of Liberia will be shown at the Carlo Auditorium at SLU from 7 to 9 PM. Also Wednesday, the finals for the PRIDE Idol Karaoke Competition will be at Just John Nightclub (4112 Manchester) starting at 9 pm. Also Wednesday, check out the show at Rehab Bar and Lounge (4054 Chouteau) at 10 PM to raise money to help raise awareness about HIV/AIDS. Thursday, March 25, at the People's Settlement, Show Me No Hate and TransHaven Missouri will be protesting Laclede Gas's policy of not offering discrimination protection to LGBTQ employees from 7 to 8 AM at 720 Olive. Also Thursday, also at the People's Settlement, there will be a Break Up With Your Bank action at Bank of America at 2 PM. Also Thursday, there will be the first ever St. Louis Transit Meetup from 5:30 to 8:25 at The Bridge Tap House and Wine Bar (1004 Locust). Also Thursday, SLU will be hosting a Social Justice Town Hall from 5:30 to 7 PM. Also Thursday, Yelp is having a 2010 Census Party at the Royale from 5:30 to 8:30 PM. Friday, March 26, at the People's Settlement, there will be an action related to Peabody Coal at 11 AM. Also Friday, also at the People's Settlement, there will be an anti-war action at 3:30 PM. Friday through Sunday is the African Film Festival at Washington University. Saturday, March 27, from 10 AM to 3 PM, there will be a Community Action Fair at the Missouri History Museum. Also Saturday, there will be a training for those interested in giving Downtown Architectural Walking Tours from 10 to 11:30 AM starting at 911 Washington Avenue. Also Saturday, from 11 AM to midnight, City Sound Tracks combines musical and visual artistry with the accessibility of Metrolink. A fantastic idea! Also Saturday, there will be an Undergraduate Conference on Colonialism and Empire at the Hurst Lounge of Dunker Hall on the Washington University Campus from 11:30 AM to 5:15 PM. Also Saturday, at the People's Settlement, there will be a Race to the Top and the Privatization of Public Education action at 11 AM, and a Privatization of Education Bake Sale at 1 PM. Also Saturday, Pride Alliance at Washington University is hosting a Drag Show from 7 to 9 PM in the Gargoyle. Sunday, March 28, the Upcycle Exchance is holding a Green CrafTea Open House from noon to 4 PM at 3022A Cherokee. Also Sunday, at the People's Settlement, there will be a Faith Based Action put on by the Catholic Action Network at 1 PM and a Labor History Tour from 3:30 to 5:30 PM. Also Sunday, QFEST kicks off at the Tivoli. Also Sunday, Focus St. Louis is hosting the Bridges Annual Event which features a discussion of the current Race Exhibit at the Missouri History Museum. Moderator Jean Ponzi, Green Resources Manager for the Missouri Botanical Garden's Earthways Center, explains how art can encourage green living. This Wednesday (doors open at 7pm), the Pulitzer Foundation for the Arts will host the third panel discussion in a series related to the exhibition Urban Alchemy/Gordon Matta-Clark. "Art and Sustainability" will focus on how we can creatively promote sustainable practices. For more information, including panelist bios, visit the website Transformation. At the protest, organized by Martin's close friend Bill Hennessy, the tea party kicked photos of Carnahan, brought an effigy of Carnahan tarred and feathered, encouraged a small child to throw shoes at a picture of Carnahan, and then burned the picture of Carnahan while saying insane things like, "I love the way fire smells when it's burning tyranny." By the way, these were not the actions of a small group of "kooks," but were encouraged by the rally organizers themselves. Other noteworthy actions from the St. Louis Tea Party this weekend: carrying a coffin to Congressman Carnahan's house to protest all of the imaginary people who will die under "Obamacare," saying that Representative Cleaver is, "A no-good, race-baiting hustler who holds his job because his daddy was an effective politician," after Cleaver was spit on by tea party protesters in D.C., and calling civil rights hero John Lewis a "racist," after Lewis was called the N-word by the same extremists. Any politician who wants to be taken seriously would denounce these actions, not approve of them. • Provide more than 30 million Americans access to affordable health coverage. • Reduce the federal deficit by $132 billion over 10 years. • 495,000 uninsured Missourians will gain health coverage. • More than 1 million Missourians will access more affordable coverage through the health insurance exchange. • 516,000 residents could qualify for premium tax credits to help them purchase health coverage. • 961,000 seniors would receive free preventive services. • 171,000 seniors would have their brand-name drug costs in the Medicare Part D “doughnut hole” halved. • 79,900 small businesses could be helped by a small business tax credit to make premiums more affordable. • Prohibit private insurance companies from turning down individuals because of pre-existing medical conditions or rescinding policies. • Prohibit annual or lifetime limits on coverage. Protect consumers with annual out of pocket spending caps after which the insurance company must pay. • Cap insurance company administrative overhead and profits, requiring insurers to use premiums to pay for medical care. Insurance companies must spend 85% of premiums on medical care in the group market and 80% in the individual market. • Strengthen oversight of insurance premium rates and rate increases. requirements created by states participating in compacts authorizing such sales. Jim Durbin Accuses Cleaver of "Lying," Calls him a "Hustler"
Jim Durbin at 24thstate today accused Representative Emmanual Cleaver of "lying" and called him a "no-good, race-baiting hustler" after Cleaver told reporters that he was called racial slurs while walking through a Washington, D.C. Tea Party crowd. Durbin said that this was all a part of a scheme by Democrats to "change the subject." Unmentioned by Durbin is the fact that if Cleaver was lying, then so were Representatives Andre Carson, James Clyburn, and John Lewis, as well as CNN reporter Dana Bash. I personally don't know much about Cleaver's history, but I know a little about Representative Lewis. The former head of the Student Nonviolent Coordinating Committee (SNCC) and a crucial figure in the civil rights movement, John Lewis was spit on, hit, and screamed at while sitting at segregated lunch counters in Nashville, Tennessee. He participated in the Freedom Rides, riding on previously segregated Greyhound buses into the South. A bus he was on was stopped by an angry white mob; and Lewis was dragged out of the bus and beaten. The idea that this man would throw out a fake claim of being called a racial slur is ridiculous. The last few days have revealed the truly ugly side of the St. Louis Tea Party, and Durbin's (as well as Gateway Pundit, Dana Loesch, and POED Patriot's) attack on civil rights leaders is among the ugliest. Yesterday, as seen in this video, the St. Louis Tea Party burned photos of Congressman Russ Carnahan and encouraged four-year-old children to throw shoes at the picture. These acts of extremism were not the actions of a few "bad apples." They were encouraged by the very people who organized the event, the co-founders of the St. Louis Tea Party Dana Loesch and Bill Hennessy. A couple days ago, Bill Hennessy claimed that the Tea Party no longer had any moral or legal obligations to the country. Yet if you watched the local TV news, you wouldn't know any of this. Instead, all you would have heard is that a group of people with concerns about their country were trying to make their voices heard. While the national media had the awareness to report on yesterday's extreme actions from the Tea Party such as calling a civil rights leader a "n****r," calling Representative Barney Frank a "*f****t", spitting on Representative Cleaver, and throwing a brick through the window of Representative Louis Slaughter, look at what we got from our local TV stations. At the event where the Carnahan photo was burned, KTVI (Fox 2 News) coverage started off with this ridiculously bad rhyme: "Though it seems too late. Though a win for the other side seems eminent, they will not be deterred. They come a long way, they go a long way, to make their voices heard." The rest of the report was full of quotes that did not explain any of the tea party's extreme views, but simply claimed that participants were "fed up with politicians," (something which everyone feels at some point but is not really relevant to this discussion given that there are politicians on both sides of the issue). The headline of Teresa Woodard's story claimed that "Misouri Voters" rallied against the health care bill, not that the St. Louis Tea Party rallied against the bill. The coverage of the St. Louis protest from KSDK was better. Jeff Small balanced the tea party quotes with points from Carnahan's spokesperson, rather than presenting all of the tea party stuff in one block as Fox did. He also got a substantive part of Hennessy's view on the subject on camera: the absurd claim that passing health care legislation is "illegal." However, there still was no mention of the tea party burning photos of Russ Carnahan and throwing shoes as part of their protest. This is not an isolated case, but in fact is part of a disturbing pattern in the St. Louis TV News industry of going out of their way to portray the Tea Party as positively as possible. No TV station has ever asked Hennessy to explain why he claimed that Obama was trying to turn our children into Nazi snitches. Instead, they present him as an "aw shucks" average guy concerned about our country. Last Year, Hennessy and Dana Loesch suggested that Democrats sent a "high level operative" to St. Louis to "incite a riot," causing fellow tea partier Jim Durbin to creep around in the bushes to take pictures because he spotted a black man in a tuxedo. Yet Loesch and Hennessy are repeatedly treated as serious political commentators. Loesch, in fact, was interviewed by KMOX on her thoughts about climate change. Jim Hoft, who has linked to white supremacist sites in the past, was recently asked for his thoughts on the Coffee Party. Even more recently, after claiming that Obama was going to indoctrinate our children, Hennessy was given a sit down in a TV news station to discuss Obama's visit. The problem is that the St. Louis TV News (with the notable exception of Charles Jaco) is creating an atmosphere of zero accountability for the Tea Party. The St. Louis Tea Party can literally say or do anything they want at their rallies, because they know that the local TV news will only present quotes that portray them as positively as possible. If the Tea Party held a rally where the participants held signs that said, "bomb congress," the local TV would run a story about how "some citizens" are concerned with higher taxes. In other words, the media allows them to say whatever they want, no matter how extreme, and then turn around and craft a positive message for the public in their interviews. This has the effect of keeping the general population completely uninformed. If you only watched the local TV news, you wouldn't know anything about the actual extremist views of the Tea Party. All you'd hear is that there are some people fed up with politicians who think that the government is too big. This is a serious problem, because the tea party is now going out of their way to encourage anger and the threat of violence, and in fact are successfully getting some of their members to commit acts of violence. If the St. Louis media is not willing to educate people about this, then it's up to us. We have to make sure to share, whether via email, Twitter, or Facebook, the actions of this group so that people have a realistic assessment of what the movement is all about. Update: Please call the news desks of Fox 2 News (314-213-7831) and KSDK (314-444-5126) and tell them that they need to inform the public about extreme tea party actions like burning photos of Russ Carnahan. It's funny that right-wing fanatics enjoy drumming up fears about Muslim extremism so much, considering that they're probably the group in the U.S. that most closely resembles the taliban's religious extremism. At the end of the video, you can hear the lady saying, "this is what happens when you don't represent the will of the people...This is how a fire smells when it's burning tyranny." 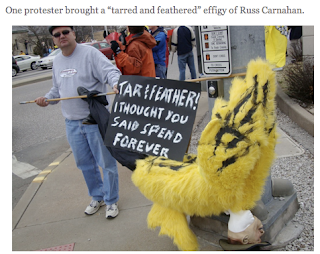 They also brought a "tarred and feathered" effigy of Representative Carnahan: Picture from Gateway Pundit. All for voting on a bill to fix an unsustainable and inhumane health care system. Nevermind. We won. They lost. Tea Party No Longer Pledges the Allegiance: "The American Experiment is Over"
How's this for nutty rhetoric? So decision one: Do we give up? Or do we storm Capitol Hill? Wow, if that's how he reacts when a Democratically elected legislative body votes to provide 30 million people with health insurance, I'd hate to see what happens when someone messes up his order at Starbucks! The irony of the Show Me Institute moving to St. Louis City while claiming that the earnings tax drives businesses away from St. Louis City was noted on this blog, in the RFT, on the Platform, on Political Fix, and at urbanSTL. And all after an insightful tweet by Patricia Bynes! One of the common responses I've seen from the Right on these blog posts is that most of the SMI employees already live in St. Louis so already have to pay the earnings tax. Hence, the argument goes, there's nothing ironic about them moving the business to the city since they already have to pay the same amount of taxes. But actually, it seems to me that this is even more ironic! Check out this quote from the Show Me Institute: "By adopting an earnings tax, a city gives businesses and residents an incentive to locate production outside the city." The original point now just applies to the individuals. If the earnings tax is so horrible, then why would almost all of the employees of the Show Me Institute choose to live in the city? Obviously, because the benefits of living in the city outweigh the small cost of the earnings tax. The Show Me Institute's attempts to demonize the earnings tax is undermined by not only the institution's location, but also by the choices of its employees! Some of my critics have been claiming that my previous post on Tea Partiers disrespecting the American Flag was "ignorant" because it was meant as a protest symbol of our country in distress. Of course, all you need to do is read the actual rules to know that flying the flag upside down as a protest is not acceptable according to those rules. But since some of my critics seem to like appeals to authority more than actual facts, let me point out how several right-wing bloggers responded to Iraq War Veteran Adam Kokesh flying the flag upside down at political rallies. Have they now convinced Iraq vets to hoist an upside down American flag... This symbolism is not about dissent against the US government, it's about disrespecting America. This Ain's Hell has railed against Kokesh and said that he can't think of him without seeing the image of him holding the upside down flag. Right-wing celebrity Michelle Malkin cited Kokesh holding the flag upside down as a reason why he was a "smear merchant." And finally, blogger Carly Fiano claimed that Kokesh was "Anti-American and anti-military" because he held an upside down flag. So it's pretty clear that the consensus among right-wing bloggers is that Kokesh disrespected the American flag despite the fact that Kokesh is a veteran and despite the fact that he was doing it as a sign of "America in distress." So the fact that some of them are attacking me now is nothing but egregious hypocrisy. And just to be clear, I personally don't have anything against Kokesh or the tea party person who held the flag upside down. But the tea partiers consistently hide behind the flag (even chanting "where's your flag?" at the protest last Wednesday) and try to use appeals to "true patriotism" in place of having meaningful discussions. They're angry at me because they can no longer make this argument with a straight face. When they had a chance to protest any way they wanted, they chose to display the flag in a way that was disrespectful according to the very rules they claim to care about. Ed Martin and the Birthers: Now on YouTube! Also, as FiredUp noted on Twitter, birther website World Net Daily approvingly linked to the story on their website. Looks like Ed Martin might quickly become a birther celebrity! Show Me Institute Moves to City Despite Claiming that Taxes Prevent Businesses from Moving to City! The right-wing think tank Show Me Institute has been claiming that the earnings tax that generates crucial revenue for the City of St. Louis drives businesses away from the city. In fact, the institute's gazillionare financier Rex Sinquefield is funding a ballot initiative to put the earning's tax in jeopardy. Ironically enough, however, the institute has decided to move to the City of St. Louis! I guess there must be other considerations that make it worth it for the institution to be located in the city, despite the earnings tax. Fancy that. (h/t to @Patricialicious 's insightful tweet). But some students accused the demonstrators of trying to slam the Obama Administration as it pushes for nationalized health care. Others felt the message was edgy , but worthy of consideration. "I mean it's out there and it's really out of the box," said graduate student Katlin Hartsell, "But I think it's good that it really gets people thinking about what the actual implications of what socialism and communism mean." But if Hartsell was at the event specifically to spread the gospel for a right-wing think tank, shouldn't Killeen identify her as doing so? And is this really a fair way to gauge student opinion on campus? The reality is that the display was very poorly received on campus, so Killeen's presenting it as "some people thought this and others thought not-this," is both inaccurate and based on inadequate journalistic practices. Monday, March 15, there will be a debate between Chesterfield Mayor John Nations and CBT's John Burns about Proposition A, the ballot initiative to raise sales taxes 1/2 of 1 % to fund public transportation in the St. Louis region. It will be at 11:30 AM at the Clayton Chamber, 50 Gay Avenue. Also Monday, Co-op Cafe at the Wash U co-op (6021 Pershing) will feature an open mic and a set from Andy Hyland from 8:30 to 10 PM. Monday and Tuesday, groups will be selling ethical chocolate for a good cause and raising awareness about child slavery at the Wash U campus from 6 to 8 PM on both days. Tuesday, March 16, Planned Parenthood will be having a Prevention First Lobby Day in Jefferson City. A bus leaves from St. Louis at 7:30 AM and returns in the evening. Also Tuesday, the MO History Museum will host a reading of one of abolitionist Elijah LoveJoy's historic editorials at 2 PM. Also Tuesday, City Affair will be passing out literature to support the Proposition A transit sales tax at the Clayton Metrolink Station from 4 to 6 PM. Also Tuesday, there will be a talk on Race and the 1904 World's Fair at the MO History Museum from 5:30 to 7:30 PM. Also Tuesday, all students across St. Louis are invited to Paint a Shirt for Prop A at the co-op at 6021 Pershing from 6:30 to 8:30 PM. There will be Free Pizza! Also Tuesday, there will be a political rally for Stacey R. Hancock at the Indigo Hotel (4630 Lindell) from 6:30 to 8:30 PM. Wednesday, March 17, Theology at the Bottleworks (2100 Locust) will feature a discussion on the topic "are we making movies or are movies making us" at 7 PM. Thursday, March 18, Andrew Young, former aide of John Edwards and author of the new book The Politician, will be speaking at the Missouri Athletic Club Art Lounge (405 Washington Ave) from 9 to 11 AM. The event will be broadcast live on KMOX. Also Thursday, Repower America and 1Sky supporters will gather outside of Claire McCaskill's office (5850 Delmar) asking her to support strong climate legislation from noon to 1 PM. Also Thursday, there will be a reception in support of Senate Candidate Robin Carnahan at Lombardo's (201 S. 20th St.) from 5:30 to 7 PM. Also Thursday, Azar Nafisi will be speaking about her book Things I've Been Silent About, detailing her life growing up in Iran, at 7 PM at Left Bank Books (399 N. Euclid). Friday, March 19, join the St. Louis Young Dems for the Jefferson Jackson Dinner After Party at Flamingo Bowl (1117 Washington Avenue) from 9:30 PM to 3 AM. Friday through Sunday, V-Day at SIUE will be presenting A Memory, a Monologue, a Rant, and A Prayer by Eve Ensler in the Abbot Auditorium from 7 to 10 PM. Saturday, March 20, Revitalize St. Louis will be holding a rehabbers club tour starting at 3848 Utah Place at 10 AM. Also Saturday, there will be a discussion of communism and particularly the Communist Manifesto at 112 South Kansas Street in Edwardsville, IL from 2:30 to 5 PM. Also Saturday, the City to River group will be touring Memorial Drive to discuss the idea of better connecting the downtown to the river. They'll be meeting from 3 to 5 PM at the Stan Musial Statue on the corner of 7th and Spruce. Also Saturday, the Great American Meatout will be held from 5 to 7 PM at the First Congregational Chuch a 6501 Wydown. Also Saturday, What's disgusting? Union Busting! Find out more about efforts to unionize Starbucks workers in Minneapolis at 2639 Cherokee from 6 to 8 PM. Also Saturday, there will be a Trivia Night Fundraiser for the Social Justice Teacher Research Group and the Center for Survivors of Torture and War Trauma at Il Monsastero, St. Louis Room (3050 Olive). Also Saturday, folk Singer John McCutcheon will be performing from 7 to 9 PM at the St. Louis County Library (1640 S. Lindbergh). Sunday, March 21, there will be a discussion of Art, Education, and Democracy facilitated by Dali Chambers at 1627 N. 19th from 1 to 3 PM. Also Sunday, there will be a book signing with St. Louis writer Angie O'Gorman from 4 to 6 PM at 1077 Newstead. Also Sunday, the Center Center for the Arts and Education (3547 Olive) will host the Kickoff Party for Q-Fest from 5 to 8 PM. Thank You to the RFT! 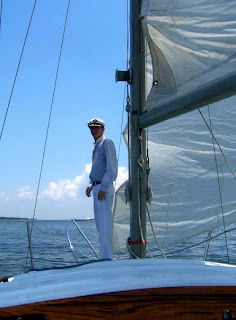 Who is CBT's John Burns?